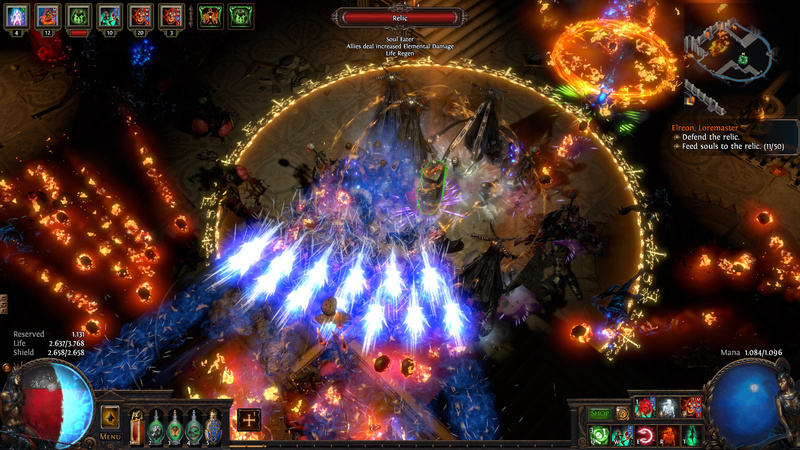 I’m having a blast in Path of Exile. The game has expanded so much over the years, it’s actually mindboggling how many systems and mechanics there are. 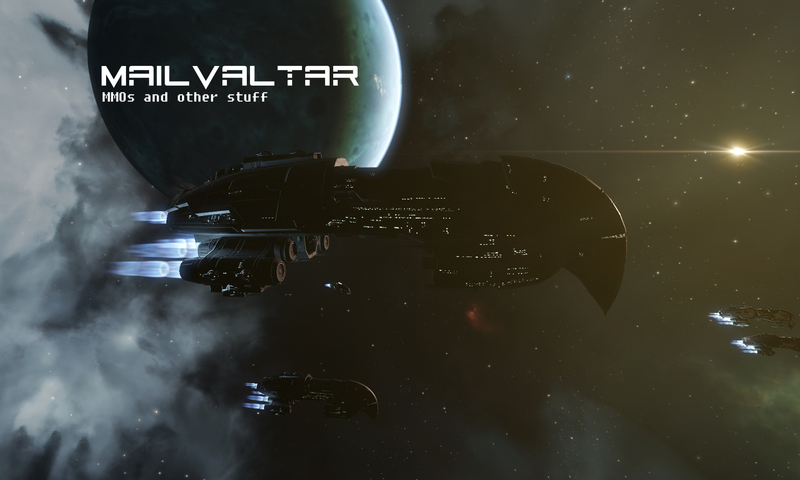 It even has customizable player housing that puts many an MMO’s take on the feature to shame. The most important aspect of an ARPG, or any RPG really, is of course how fun the characters are to play and evolve though. And I have to say, I’ve never had so much fun just running around and killing stuff in any game of any genre than with my Summoner in PoE. The game provides nearly infinite possibilities to build your characters to your liking, and while I used a build guide I found in the official forums as a starting point for this Witch she has over time become my very own flavor of the Summoner playstyle. It is not the most effective or powerful character possible, not even close, but this is exactly how I wanted to play an ‘Armymancer’ since Diablo II introduced me to the concept. Many Summoner builds are highly specialized, using only one type of minion as their main source of damage. Other minions are mostly there as meatshields, or not used at all. In contrast, my goal was to not only have as many minions as possible, I also wanted them to be relatively equal in damage output and general usefulness, maybe just with a different focus (like single target or AoE). Just like an oldschool real world army with infantry, cavalry and artillery, so to speak. 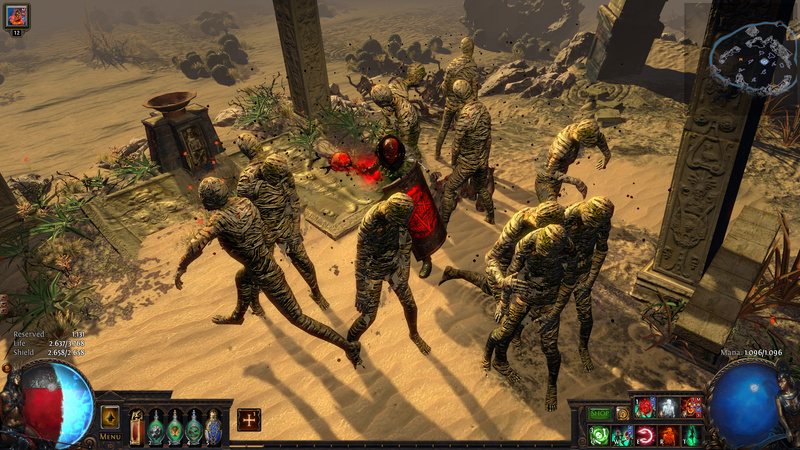 The tried and true backbone of most Summoner builds in PoE are Zombies. They are summoned from the corpses of dead monsters, are pretty tanky and have a single target as well as an AoE melee attack. They don’t have a limited duration, so they only need to be resummoned if they die. I use them in a helmet I crafted with +2 to minion gem levels, three damage enhancing support gems and two unique passive tree jewels to further boost them. They are very good meatshields, but also deal a lot of damage. I can have up to twelve of them. Mine look like Mummies, because Mummies are just way cooler than stinking Zombies. Next up are Spectres, which are reanimated monsters. 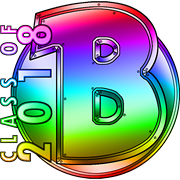 These are obviously the most flexible and potentially also the most powerful minions, since almost any normal monster can be revived, and all of its attacks, spells or special properties stay intact. Not only that, they can be enhanced with support skills just like every normal player skill can. This means that a monster that normally shoots a single projectile can for example be supported by Greater Multiple Projectiles to shoot five instead. 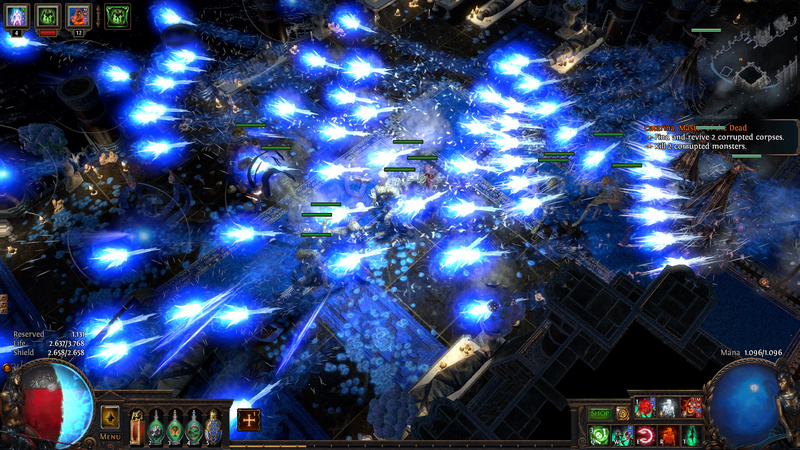 Which makes monsters like Frost Sentinels great Spectres for clearing whole screens of baddies in an instant. Which is exactly what I use them for. 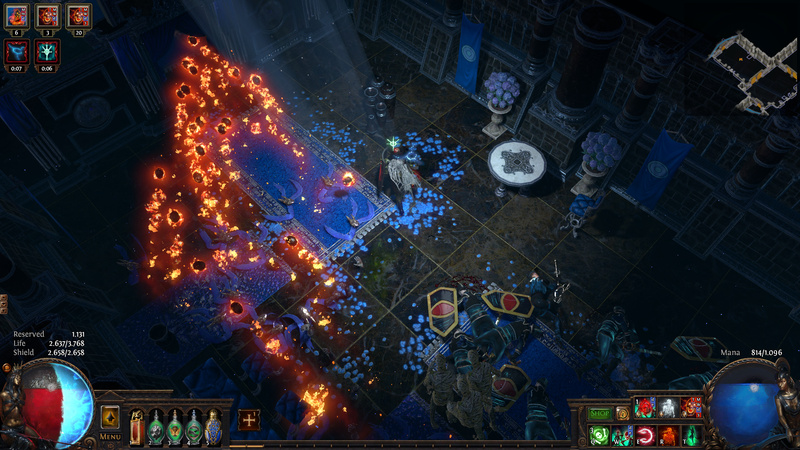 Since they are so powerful a character can only have one Spectre by default, but pretty much all such restrictions in PoE can be loosened by special properties of unique items and/or the passive tree. I can use four Spectres at the moment. I could bring that up to five, but I’d have to give up much survivability for that, and I’m pretty squishy as is. In contrast to Diablo II they thankfully don’t have a limited duration here and even persist after logging out. I also use Raging Spirits. These are fiery floating skulls that, once summoned, fly to their nearest target to continuously attack and kill it, then fly to the next, until their by default pretty short duration has expired. Up to twenty can be summoned at a time, and to achieve that manually one would have to cast them pretty much non stop. Hence I decided to use a unique chest armor which has a built-in Spell Totem support. This means that every spell gem I socket into it isn’t cast directly anymore. Instead a totem is placed at the position of my mouse cursor, which then continuously casts the spell for me. Since the chest piece also raises the maximum amount of totems by one I can now place up to three, which combined spit out Raging Spirits very quickly. They are pretty effective boss killers, but also clear packs well. Always eagerly chasing after their next prey. It goes without saying that no undead army would be complete without Skeletons. 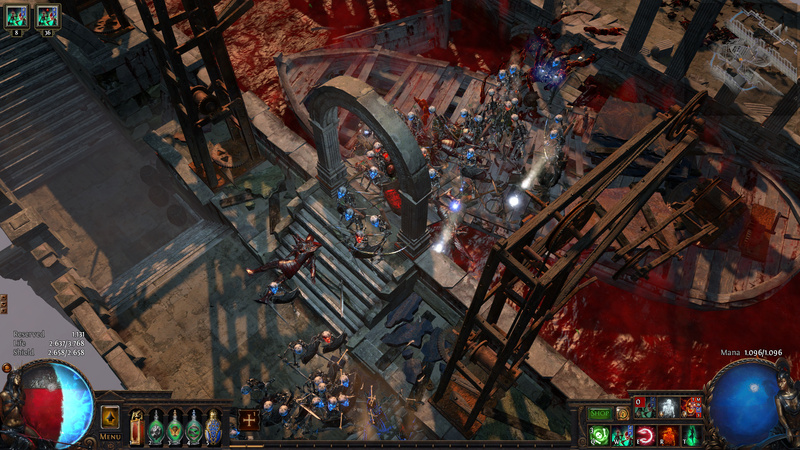 In PoE these don’t need a corpse to be summoned, but have a limited duration. Basically I cast these whenever I have nothing more important to do. I have supported them with additional speed and damage and can have up to ten. The setup also contains a Vaal Summon Skeleton skill gem. Vaal skills are more powerful versions of normal skills that have to be fed a certain amount of souls by killing monsters before they can be used once. I mainly use this for bosses, as it summons a whopping 36 skeletons, a mix of warriors, archers, mages and a General. Lastly I use a Stone Golem, which doesn’t do a lot of damage but gives myself a nice bonus to life regeneration. 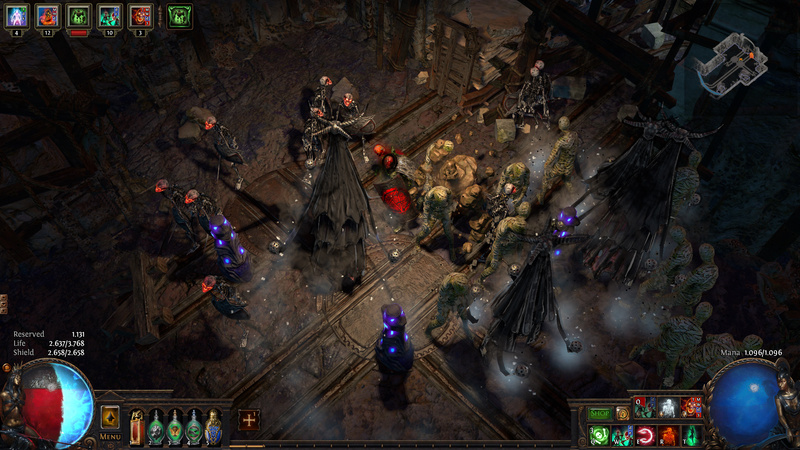 To sum it up, when I have all minions except the Vaal Skeletons up and running I have 12 Zombies, 4 Spectres, 10 Skeletons, 1 Golem and three totems casting up to 20 Raging Spirits. There’s always a team meeting before battle. Of course a good General doesn’t just twiddle his thumbs while his army does all the work. I have a range of skills that I use to support as well as direct the minions. I curse monsters with Vulnerability, making them take more physical damage (which all my minions deal at least in part except for the Frost Sentinels). It also serves handily to guide the minions’ attention towards the cursed area. I use the Hatred aura to give all minions inside its radius a percentage of their physical damage as bonus cold damage. A Generosity support gem makes the aura no longer affect myself, but increases its effect and radius, making it even stronger for the minions. With Convocation I can teleport all Zombies, Spectres and the Golem to my position (a skill Diablo II’s Necromancer would have desperately needed) and give them a small Heal over Time. Offering skills blow up monster corpses to give my minions certain buffs for a period of time. I mostly use Flesh Offering, which increases attack, cast and move speed. When the minions take too much damage I use Bone Offering instead, giving them block chance and additional life regeneration when they block. Desecrate lets me summon monster corpses whenever I need any but don’t have enough at my disposal (think boss fight without any adds). Lastly I use a life flask that applies its healing effect not only to myself, but in part also to all minions. Playing this character feels incredibly satisfying and never becomes a chore. Sometimes there’s so much mayhem going on that I can hardly see anything, but that’s a price I gladly pay for finally being able to play my perfect version of an Armymancer. Now all GGG have to do is find a fix for those freezes and ‘unexpected disconnections’ that happen to me regularly as of late. Seriously, what’s up with that?